A sturdy, symmetrically built working terrier like the Sealyhams of old. There should be a combination of substance, power, balance and hard muscular condition. Any tendency to grossness or weediness is a serious fault. In balance with other proportions of the dog, and in keeping with its general conformation. Skull - broad, only slightly curved between the ears, flattening to a slight but definite stop. Foreface - broad and well filled under the eye with a medium length, deep muzzle. Cheeks - muscular, but not coarse or prominent. Nose - black irrespective of the color of the dog. Nose - black irrespective of the color of the dog. Jaw - strong, deep and well developed. Lips - tight and clean. Teeth - sound and regularly placed, gripping with a scissor-like action, the lower incisors close behind and just touching the upper. Not to be overshot or undershot. Eyes - dark, almond-shaped eyes, neither prominent nor sunken, with well-pigmented eye rims. Ears - moderate in size, preferably small, V-shaped and carried close to the head. Prick or flyaway ears are undesirable. Neck is strong, muscular and of medium length, broadening to blend into the body and free from throatiness. The shoulders are broad of blade, sloping, muscular and well angulated to the upper arm and at the point of the withers should not be too closely set. The forelegs have strong, round bones, extending to the feet without weakness of the pasterns. The forelegs should be perfectly straight when viewed from the front. Hindquarters are broad, strong and muscular. Thighs are long, broad and well-let down. When viewed from behind the hind legs, from the hocks to the feet, are straight and placed neither close nor too wide apart. The length of the body from the point of the breastbone in a straight line to the buttocks is slightly greater than the height at the withers. The topline is level, back strong, with ribs well sprung and ribbed back (not barrel ribbed). The chest is deep and muscular and moderately broad, loins are broad, deep and muscular with deep flanks strongly coupled between the fore and hindquarters. The set of tail is neither high nor low set. The coat is fairly harsh, weather resistant and of medium length. Very soft, fluffy coats are undesirable but short, harsh Norfolk type coats are acceptable. Coat colors = (Frost). The color should be tan (all shades) or saddle and tan (the saddle can be black or bluish grey). White markings in the pattern of Irish spotting (i.e., around the muzzle, on the feet and legs, on the underside, on the chest area and/or around the neck) are acceptable. Black or bluish grey should not be the predominant color. (Irwin) An 'Irwin' Lucas terrier should have a base coat of white with colored markings in a piebald or extreme white spotted pattern. 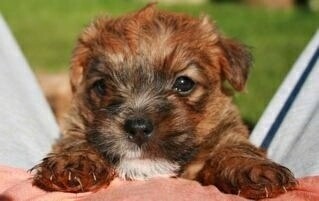 Markings may be tan (all shades), black, badger-grey, black and tan or badger-grey and tan. A completely white dog is acceptable. The Lucas Terrier is a small, sweet, non-exaggerated British terrier that is making a comeback in popularity in the U.S. Smart and easy to train. Friendly toward people and other dogs. Excellent with children. Eagar to please. Not a yapper by nature. Likes to dig. Make sure you are this dog's firm, confident, consistent pack leader to avoid Small Dog Syndrome, human induced behavior problems. Always remember, dogs are canines, not humans. Be sure to meet their natural instincts as animals. Few health problems reported in this generally healthy, long-lived breed. Good for apartment living. They are relatively inactive indoors and will do okay without a yard. This breed needs a daily walk. Play will take care of a lot of their exercise needs, however, as with all breeds, play will not fulfill their primal instinct to walk. Dogs that do not get to go on daily walks are more likely to display behavior problems. They will also enjoy a good romp in a safe, open area off lead, such as a large, fenced-in yard. The breed is a low-energy dog that makes a good walking companion. Calm and content indoors, adaptable to life in town or the country. Brush weekly, bathe occasionally when necessary. Hand stripping is the preferred method of grooming this breed's double coat. They shed little to no hair and have low doggie odor. Developed in the late 1940s by Sir Jocelyn Lucas of Great Britain. He felt the Sealyham Terrier was too big to work efficiently and concerned about the increase in whelping deaths, crossed Sealyham Terrier females with Norfolk Terrier males, creating the Lucas Terrier. 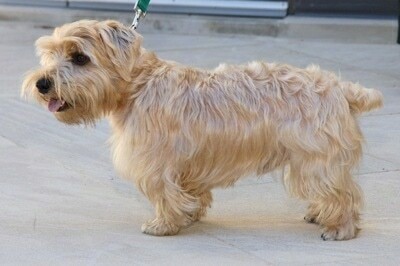 The Lucas is similar in appearance to the Sealyham Terriers of the 1920s and 1930s. Lucas Terriers have been in the USA since the late 1960s. This is a rare breed, with less than 100 inside the USA. 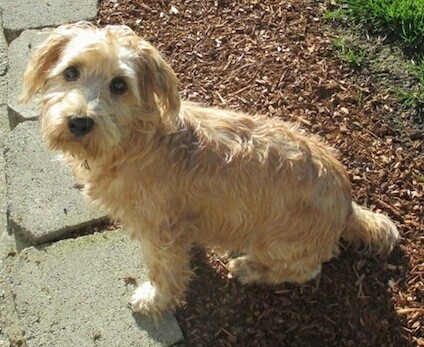 The Lucas Terrier may be bred to either of its parent breeds, the Sealyham Terrier or the Norfolk Terrier, and still be considered a purebred Lucas. "Harper the Lucas Terrier at 7 months old is always eager to learn."